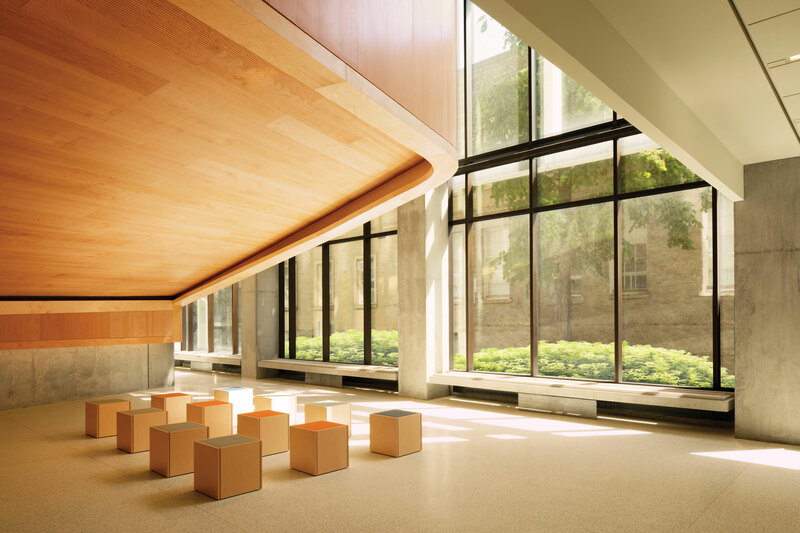 In this essay, authored for the University of Toronto publication ‘Ambition, Innovation & Excellence: The Skule Story 2000-2018’, architects – Robert Davies and Peter Clegg discuss the concepts that drove the design of the Myhal Centre for Engineering Innovation and Entrepreneurship. The entire publication, outlining the Faculty of Engineering’s rich and vibrant history can be found here. ‘Mise en place’ is a French culinary phrase that translates to English as “everything in its place.” It refers to the preparation, measurement and arrangement of all ingredients to be used in a recipe before the act of cooking. In a professional kitchen, this is often the work of the sous chef. Translated to building design, ‘mise en place’ can be compared to an engineer’s methodical approach to problem solving. As architects, we always want to know what the engineers on the team think, as early in the design process as possible. We appreciate that they are trained to ﬁnd the most direct and efficient solution to any given problem using mathematical and scientiﬁc methods. Generally, when the problem has been clearly stated, the solution is pragmatic, and ultimately forms an essential part of the building design. There is a certain “calculable truth” that is reassuring and forms the backbone of a project—everything in its place. Architects follow a similar process, but add elements to a design that are less measurable, such as: how the building will affect the senses; what it will look like; how the sun will shine on it and what shadows will result; what it’s like to touch; and how it will make one feel—relaxed, calm, welcomed? We work hard to establish a thesis for each project to produce a building that is articulate in its design and sincere in its meaning. A thesis, in turn, establishes clear guiding principles that are used to measure each design decision and help guide the team to a coherent architectural result. 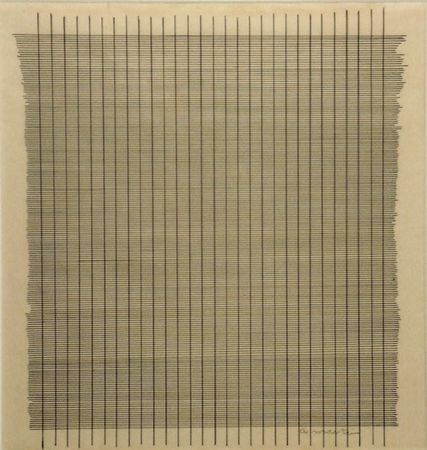 For the design of the Myhal Centre for Engineering Innovation & Entrepreneurship we looked to the work of the painter Agnes Martin. Martin had a life-long interest in Western and Chinese Classicism, sharing the belief that perfection can only exist in the mind. Her paintings appear at ﬁrst glance to aspire to a kind of engineering precision—or perfection—but are actually about how human beings can never truly achieve perfection. When examined closely one sees that they are freely drawn, touched by human hands and not as perfect as they ﬁrst appear. In a similar sense, we are interested in architecture that aspires to an idea of engineering precision while encouraging the messy and chaotic activities of human beings, an ideal of the mind with plenty of room for the body. Essentially, it is a building for engineering study, occupied by engineers. The Myhal Centre is a cube in form, 44.5 metres wide by 44.6 metres deep by 43.7 metres tall, and is best understood by an analysis of the section, which consists of three significant voids. The first void is created by the Lee & Margaret Lau Auditorium, which comprises more than 60 per cent of Levels 1 and 2. From two primary entrances on the ground floor, the tiered seating—which can accommodate up to 468 people—rises up to the second level mezzanine, where there are two other entrances. The underside of the tiered seating of the lecture hall creates the second significant void. Through an opening in the ground floor, the two-storey-high Engineering Society Arena on Level 0 is visible. Supported by a $1 million gift from the students themselves, through the leadership of the Engineering Society, the Arena is uniquely designed to support a rich variety of co-curricular clubs and teams. 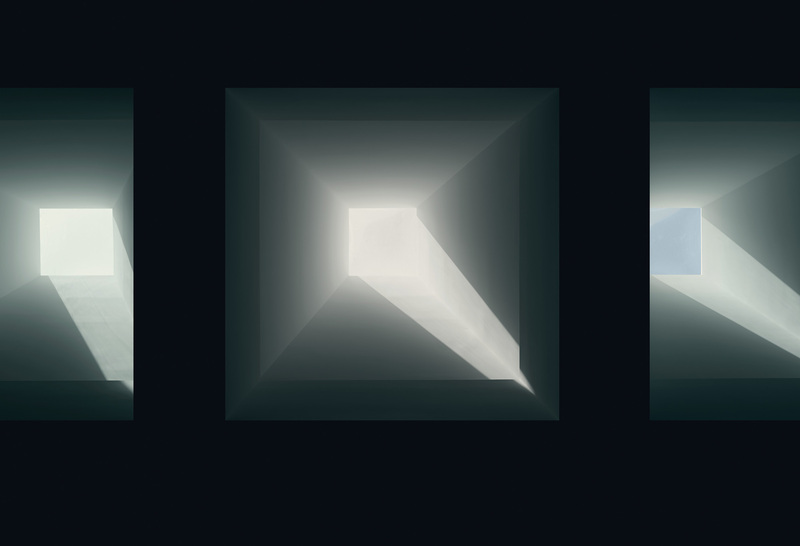 The third void occupies the centre of the building, rising from Level 5 through to Level 8 and topped by six conical light shafts. This void has come to be known as the “revealed atrium” due to the way it reveals itself without forewarning as you rise up through the building. It is the lungs and heart of the activity centres that make up the innovation and entrepreneurial programs of the Myhal Centre. 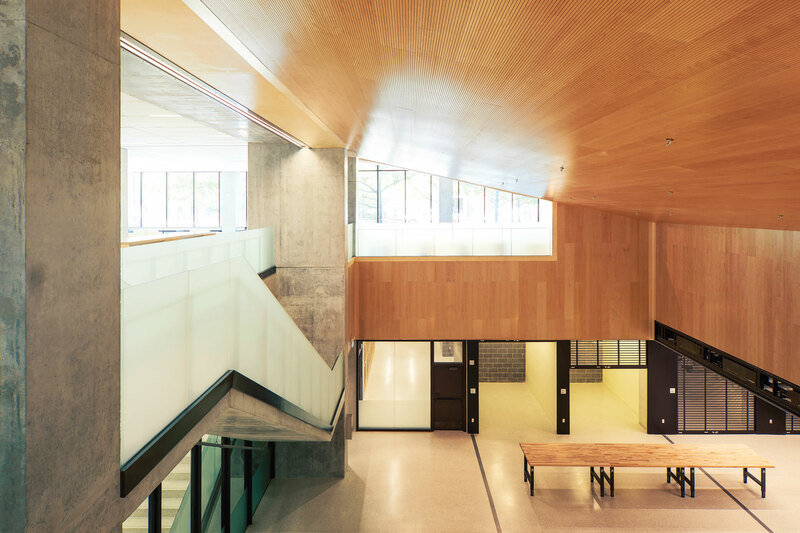 The faces of the atrium consist of exposed concrete columns and beams and acoustic panels made of Douglas fir with tiny slots to absorb sound. The north and south faces have vertical windows and panels to provide privacy to an array of offices and meeting rooms. The east and west faces have horizontal openings and panels and provide an overlook to the atrium. Massive concrete transfer beams run through Levels 3 and 4. These four parallel beams carry the loads of the floors above. Such is the required strength of these beams that they are poured of concrete with a compressive strength of 60 megapascals, whereas the adjacent beams and slabs have a compressive strength of only 35 megapascals. There is a noticeable colour differentiation between these two concrete strengths that can be seen as they blend together in the beams at the classrooms, making it an ideal teaching aid for future engineers. A stair of convenience connects all the floors of the building from Level 0 to Level 8. Each step has a rise of 165 mm and a run of 355 mm, making the stairs gentle to walk and inviting to use. The low iron content of the glass in the balustrade combined with the sandblasted finish creates a white translucent glow from the southern windows. The entire stair is a space for casual gathering, meeting and study. The stair moves from west to east across the south facade from Level 1 to Level 4 and provides an overlook to both the new court created between Myhal Centre and the Geography Building. It then changes orientation and rises north up and into the revealed atrium. From there it continues switching back from north to south with a generous landing between each floor. The balustrade for the stair in the atrium consists of acoustic panels made of Douglas fir. Two required fire exit stairs are located at the north east and north west corners of the building each with large landings and windows overlooking the beauty of Knox College. A glazed door with side-light into the stairs provides views and daylight into the corridor. It is imagined that the landings of these stairs will become part of the valuable “in-between” space providing casual spaces for encounters and study. The exterior facades of the Myhal Centre consist of windows, operable and fixed, and precast concrete and brick panels. The windows span from floor to the underside of the upper beam, thereby casting light deep into the floor plate. The overall window-to-wall ratio is 40:60, and other than a few rooms on Level 0, there are no spaces anywhere in the building that don’t have access to daylight and views, often in more than one direction. Though all four exterior facades of the building consist of the same material, they have different features depending on their orientation to the solar coordinates. The east and west facades have vertical fins that project in front of the plane of the glass to provide early morning and late afternoon shade. The south facade has similar projections that are horizontal to shade the glass from the high summer sun. The north facade has no projecting fins in order to maximize daylight penetration. Of special note is the low-iron glass that allows light through and provides little reflection or colouration. Raised flooring has been installed in Levels 3 through 8. Ventilation, power distribution and internet connectivity can occur under this raised floor, leaving the spaces above free of ducts and ceilings, and enabling the concrete structural system of beam and slab to be exposed and easily comprehended. This approach also allows for flexibility over the projected 100-year life span of the building. For the ventilation system, we worked with consulting engineering firm Smith + Andersen to incorporate four shafts on the building quadrants. This way, no floor diffuser was more than 50 feet from the riser, and the amount of ductwork was reduced. In the Lee & Margaret Lau Auditorium, air flows from under the seats, through the displacement diffusers, and is directed back to the return air system hidden behind the massive projection screen. The Myhal Centre utilizes the University’s district plant steam and condensate services from the Central Utilities Plant, connected through a service tunnel along Galbraith Road. In the basement steam room, the steam is converted into two heating water distribution systems: perimeter heating and air handler coil heating. For humidification, steam is generated by a steam-to-steam generator. A study of the University’s district plant chilled water services concluded that the most cost-effective solution for the building was a dedicated central chiller plant. In total, nine air handling units and two heat recovery units are used in this building. Air handlers with heat recovery are located in the basement and penthouse mechanical rooms and are capable of 100 per cent free cooling. Most of the air handlers are equipped with heat pipes for greater dehumidification, due to higher occupancy and latent heat. Air is returned to the penthouse via the multi-storey central atrium. A large amount of ductwork is saved by using the penthouse mechanical room as a relief air plenum, which was designed to reduce noise transmission to neighbouring buildings. The mechanical penthouse also contains a continuous walking path specifically designed to allow students to observe the functions of the physical plant as part of a course offering. The roof of the penthouse is filled to capacity with an array of photovoltaic cells. Supply air for perimeter zone ventilation will be drawn though the window and mechanically transferred to the penthouse. The internal zone works as a “normal” condition. Localized instantaneous electric domestic hot water heaters, to avoid the energy loss of a domestic hot water recirculation system. The aesthetic of the building is quiet and simple, and the material selections reflect this, starting with the decision to expose the cast-in-place concrete structure. Considerable care in the specification and workmanship of the concrete has yielded a good quality finish with square tight corners. This is complimented by Baltic birch wood panels and millwork, bronze railings and trim pieces, low iron glass balustrades and dark grey cork wall finishes. The main public floors of the building consist of terrazzo, which is hard wearing and easy to maintain. The finish on the raised floor is concrete tile in the public areas and carpet in the classrooms. The colour palette is intentionally muted so that the occupants of the building can provide the colour through their clothing choices as seasons and fashions change over the next 100 years. In conclusion, the Myhal Centre show-cases an architecture that is disciplined and quiet, even understated. It is not about itself, but about the activities that will occur within it and change over time. This is an architecture that is robust and enduring.